The second bug-fix and stability release of Enlightenment E22 was announced last night. Here’s how to install it in Ubuntu 17.10, Ubuntu 16.04, and Ubuntu 14.04. 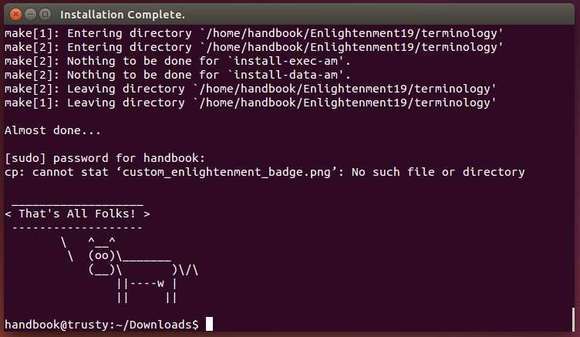 For all current Ubuntu releases and derivatives, Enlightenment 0.22.2 is available for install via the PPA repository. Type in your password and hit Enter to add the E21 PPA, though it contains e19 in its name. 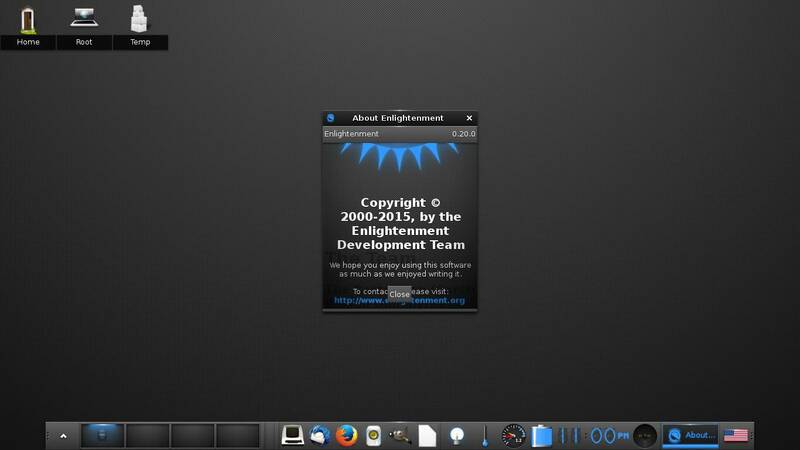 The Enlightenment desktop environment reached the new major 22 release a few days ago. Here’s how to install it via PPA in Ubuntu 14.04, Ubuntu 16.04, Ubuntu 17.04, and Ubuntu 17.10. For all current Ubuntu releases and derivatives, Enlightenment 0.22 is available for install via the PPA repository. Enlightenment E21 got a new bugfix and stability release a few days ago. Here’s how to install it in Ubuntu 14.04, Ubuntu 16.04, Ubuntu 17.04 via PPA. 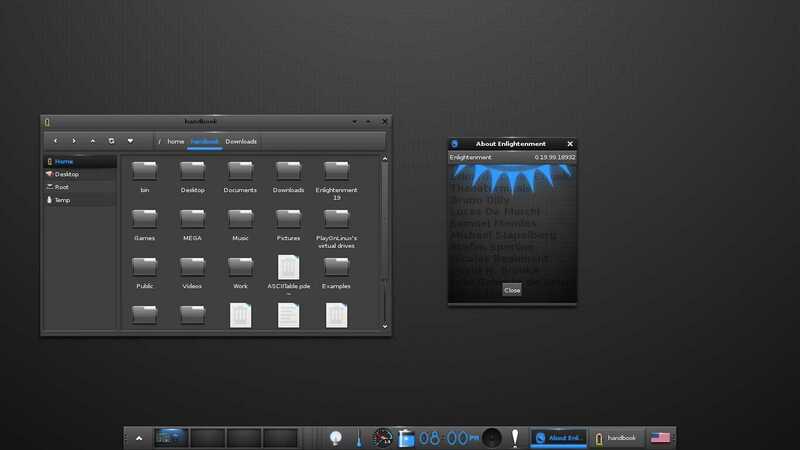 Enlightenment is a compositing and stacking window manager for the X Window System. 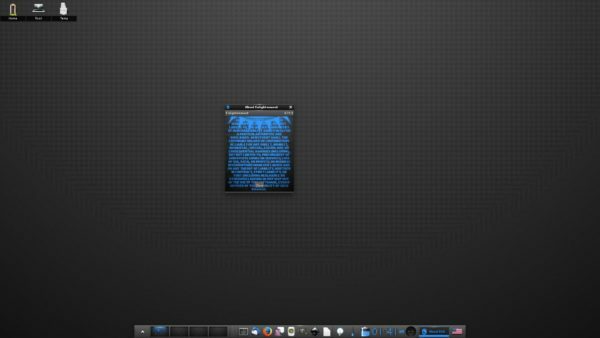 Since version 20, it is also a Wayland compositor. The latest Enlightenment 0.21.8 was release last week with a number of fixes, including some display fixes, avoid starting XWayland repeatedly, X11 and Wayland specific alterations, and other routine work. The Enlightenment 0.20 was released two days ago. Here’s how to install it via PPA in Ubuntu 15.10, Ubuntu 14.04, Ubuntu 12.04, and derivatives. The E20 development cycle has come to a close, with 1890 patches submitted by over 50 developers in the course of 441 days. 25+ reported Coverity analyzer issues and 165 tickets were addressed during this time (based on commit message tagging). I’d like to personally thank everyone who contributed, whether by submitting patches, writing documentation, reporting bugs, or simply providing feedback on IRC. There’s a PPA repository contains stable version of e20 packages for Ubuntu 15.10, Ubuntu 15.04, Ubuntu 14.04, and Ubuntu 12.04. Type in your password when it asks, no visual feedback just type in mind, and hit Enter to continue. Once installed, log out and log in back with Enlightenment session. Enlightenment 0.19.0 stable has been released recently. One of the best new features in E19 is the full wayland support. 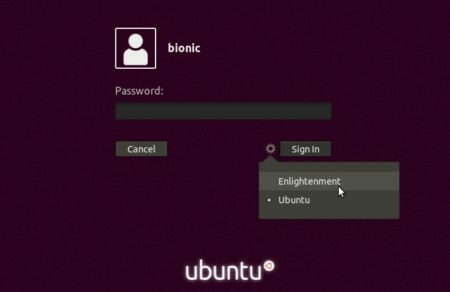 In this quick tutorial I’ll show you how to install the Enlightenment window manager 0.19.0 (E19) in Ubuntu easily with a bash script. Tested in Ubuntu 14.04.1 64-bit. e_uuid_store: Add infrastructure to store window/surface properties. Tiling: Merge the tiling module rework.. Thanks to batden, there’s now a bash script to make it easy to install / upgrade / uninstall the E19 (git version) in Ubuntu 14.04 LTS. All you need to do is download & install the script and answer on screen prompts during the installing process. 1. To download the script, right-click the link below and click “Save link as …” and save the file nineteen.sh to Downloads folder..
You can also download the script from the ubuntuforums thread. 2. After you downloaded the script, make it executable and run it. 3. 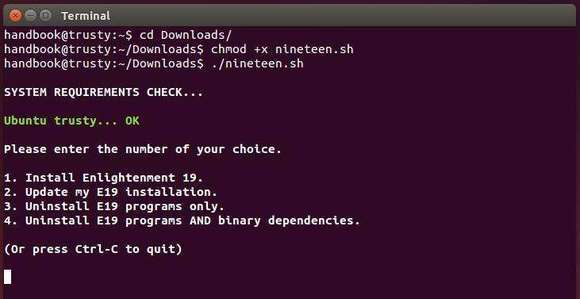 When the script starts, type a number to select install, update, or uninstall E19 (see above picture.) and hit Enter. After that, it will pop up a information dialog and then ask you to insert your user password. Not that, terminal does not give visual feed back when typing a password, just type in mind and hit enter. 4. After that, the script will update & upgrade your system, download all Enlightenment packages, and finally compile them on your system. Depends on your internet connection, the process will cost a few minutes. During this period of time, it will ask two or three questions, so don’t go too far away! 5. When everything’s done, you should see something like below. 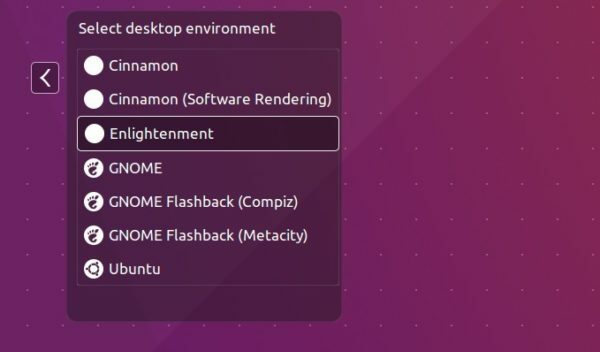 Restart your computer and select log in with Enlightenment when you’re at Unity Greeter and enjoy!